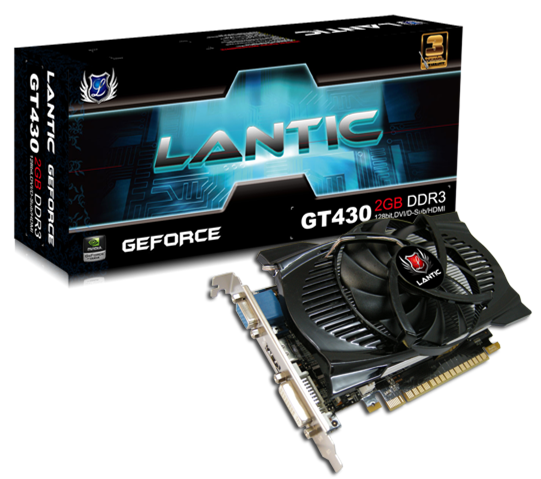 Lantic Technology Inc. and GF Station together strongly recommend the Lantic GT430 2GB DDR3 high-capacity basic edition, satisfying your need to enjoy high resolution without having to pay too high a price; let the ultra-large memory capacity cruise the gaming world with you and help you train on all your skills. The size of the memory is always most important for a video card, so obviously, video cards with a large memory capacity can bring faster processing speed for our computers. The size of the memory determines the monitor resolution size and the depth of color the monitor can display. Generally speaking, the more the memory, the more video data may be stored, and the higher the supported resolution and color depth is; 2D and 3D image render display performance will be higher too.